Offering relevant, budget-friendly, T-designated CE for pharmacy technicians. 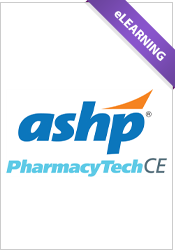 Get PharmacyTechCE.org for FREE when you become a technician member of ASHP. Join now for only $53. Already a Technician Member? Access your CE Activities now! To purchase access for multiple users, enter the number of users in the Quantity box. Employers of pharmacy technicians can make a group purchase. For a custom group purchase quote for your organization, contact Chris Jezowski at cjezowski@ashp.org. Learn from expert faculty, including other pharmacy technicians, how to expand your role and keep up-to-date on the latest pharmacy issues and trends. Multiple formats are provided 24 hours a day, seven days a week, offering both convenience and flexibility. Each purchase offers twelve months of timely T-designated CE, with new topics added throughout the year. For a complete list of topics and formats, visit www.PharmacyTechCE.